PSNews - The Provincial People’s Committee of Khanh Hoa organized a conference on April 4 to review outcomes of the movement of “All people protecting national security” in 2018 and roll out working plans for 2019. PSNews – Under the authority of the Minister of Public Security, Senior Lieutenant General Le Quy Vuong, Member of the Party Central Committee, Deputy Minister of Public Security on April 2 announced a decision issued by the Minister of Public Security to appoint Major General Vu Xuan Dung to the post of Director of the Police Department for Administrative Management of Social Order. PSNews - Over the past time, the police officers and soldiers of the Internal Security Division under the Quang Ngai Provincial Police Department have effectively implemented their tasks, ensuring social security, building solidarity among local ethnic groups, and contributing to socio-economic development of the locality. PSNews - Lieutenant Nguyen Van Lap, a police officer of the General Investigation Team of the Ky Son District Police (Nghe An Province) has been known as a young, smart and brave scout, and made many achievements in the fight against crimes. PSNews – A delegation of the Ha Tinh Provincial Police Department visited Bolykhamxay Province of Laos and congratulated the Provincial Police Department, local authority and people on their traditional New Year. PSNews - The Ministry of Public Security (MPS) started conducting the Population and Housing Census across its subordinate agencies and units from 8 am on April 1st, and the mission is expected to end on April 10th, according to the Steering Committee for Population and Housing Census of the MPS. PSNews - The People's Police College 2 under the Ministry of Public Security on April 1 in collaboration with the Party Committee, People’s Committee and the Vietnam Fatherland Front Committee of Ben Cau District, Tay Ninh Province launched a practicum in which over 360 students of the school would experience a practical training period in localities. PSNews - The Municipal Police Department of Hanoi organized a ceremony on April 1 to announce a decision to deploy professional officers to communal police posts of 23 communes of 13 districts. Lieutenant General Doan Duy Khuong, Director of the Hanoi Municipal Police chaired the event. PSNews - Senior Lieutenant General Nguyen Van Thanh, Member of the Party Central Committee and Deputy Minister of Public Security, on April 1 announced an important decision related to the post of directorship of the Provincial Police Department of Binh Duong. PSNews – Youths of the Economic Police Office under the Phu Yen Provincial Police Department coordinated with Medic Hospital Binh Duong and youths of Hoa Tan Dong commune (Dong Hoa district, Phu Yen) to organize a charitable program on March 30 in Hoa Tan Dong commune. PSNews – The Nghe An Provincial Police’s Youth Union has recently provided 150 million VND to Muong Long 2 Primary School in Ky Son district, Nghe An province to build a boarding house for students. MPS to launch book exhibition on "Public Security Forces following Uncle Ho's teachings"
PSNews - The Department of Party and Political Work under the Ministry of Public Security (MPS) on March 28 held a meeting to roll out the MPS's plans on organizing a book exhibition and reading movement themed "Public Security Forces following Uncle Ho's teachings." Minister To Lam works with Ly Son island district. PSNews - General To Lam, Minister of Public Security leading a working delegation, on March 28, visited and worked with the local authorities of Ly Son island district (Quang Ngai province) on issues related to public order and security in the locality as well as to the building of the local police force. PSNews – The Provincial Police Department of Binh Duong organized a ceremony on March 28 to review the movement of “All people protecting national security” in 2018 and roll out new action plans for the movement in 2019. PSNews–The Ministry of Public Security (MPS) and the Provincial Police of Nam Dinh organized a ceremony on March 27 to announce the appointment of new director of the Nam Dinh Provincial Police Department. PSNews - The Ministry of Public Security (MPS) and Ministry of Education and Training organized a conference on March 26 to review 3 years implementing Joint Circular No. 06/2015 / TTLT / BCA-BGDĐT guiding the two sectors in coordinating with each other in protecting national security, ensuring social order and safety, and fighting crimes and other law violations in the education and training sector. 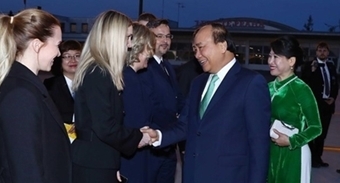 PSNews - The Ministry of Public Security (MPS) of Vietnam on March 26 hosted a meeting to review the outcomes of the cooperation between Vietnam and Laos and Cambodia in preventing and fighting human trafficking. PSNews - The Youth Union Chapter of the Department of Communication of Public Security (DCPS) on March 23 held a ceremony in Hanoi to mark the 88th founding anniversary of the Ho Chi Minh Communist Youth Union (HCYU). At the event, former youth union officials have shared their experiences and encouraged youth union members of DCPS. PSNews – The Can Tho Municipal Police on March 26 held a ceremony in Dong Thang commune, Co Do district to hand over a “comradeship” house to a police officer of the Co Do District Police. PSNews - The Ministry of Public Security on March 26 held a conference to review 10 years implementing the movement of "Public security youths following Uncle Ho's 6 teachings" in the 2008-2018 period and to roll out key missions for the coming time.